What’s In The Name, Big Dog Mom? If you are new to Big Dog Mom, I welcome you with open arms and some very big paws! 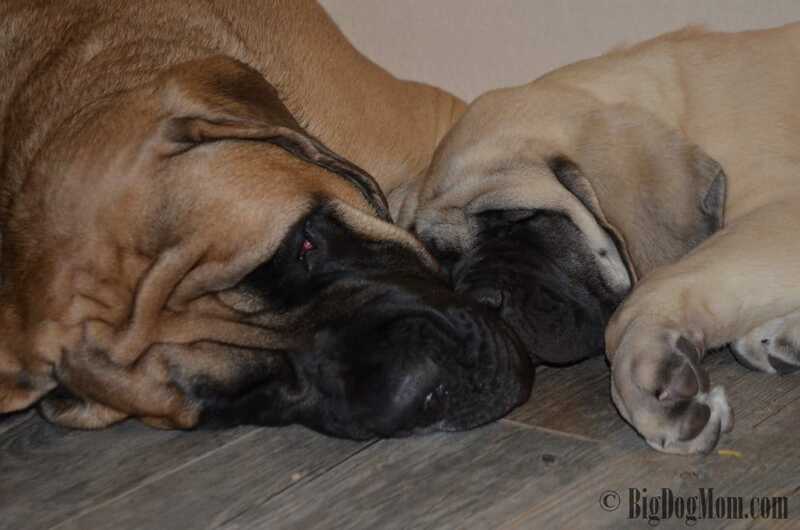 As I sit here and type this post with my two faithful mastiffs at my feet, I am reminded of the instrumental role big dogs have played in my life. 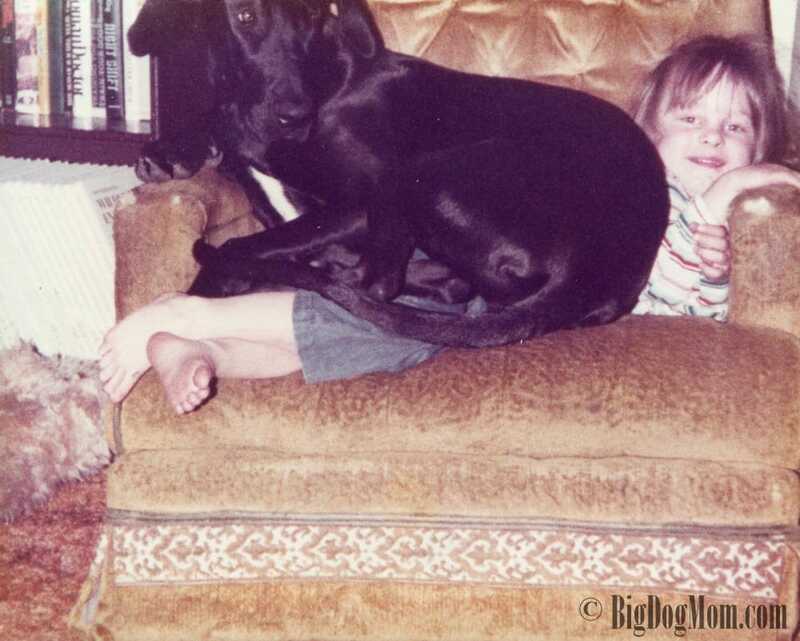 From my earliest memories as a child, I loved and was loved and adored by a big dog. Each one of my dogs will receive a post (or two, or three…) of their own eventually, but for now I just want to introduce them. By the time you finish reading this the name Big Dog Mom will garner a whole new meaning. On an Army base in Colorado, with the innocence of a toddler, I mistakenly sat on the Lazy Boy that was claimed by Jeda, our beautiful (and very heavy) black Great Dane. She showed me the error of my mistake by promptly sitting on me. 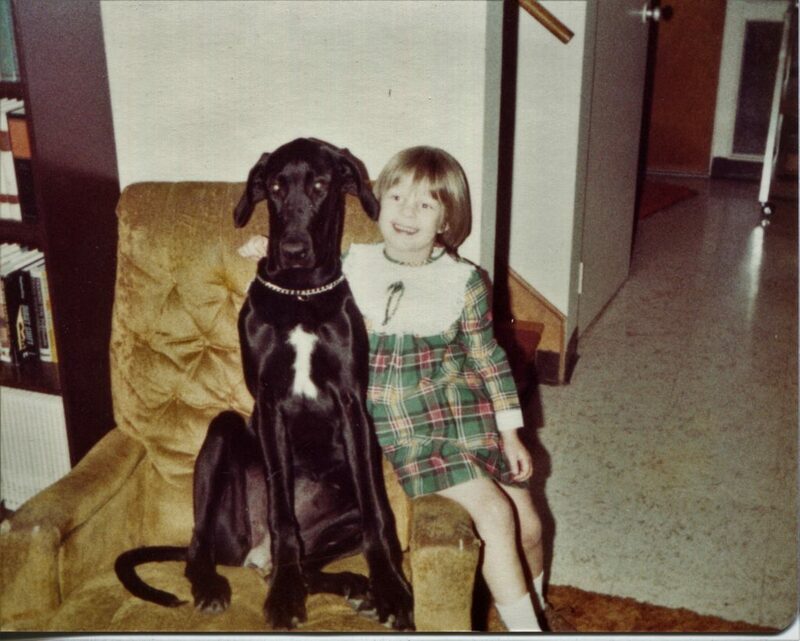 Years later, having shown Irish Setters prior to having children, my mother purchased her first show quality (I hate that term and will explain why in a future post) Great Dane. Keola was a beautiful fawn brindle male. As a preschooler, I hardly understood the importance of health testing, what it meant to be a reputable breeder, or the special care that would need to be taken in order to care for and support a giant like Keola. My mother was absolutely devastated when she found out that Keola’s difficulty walking was due to hip dysplasia. I have been so blessed to share my adult life with some amazing big dogs! 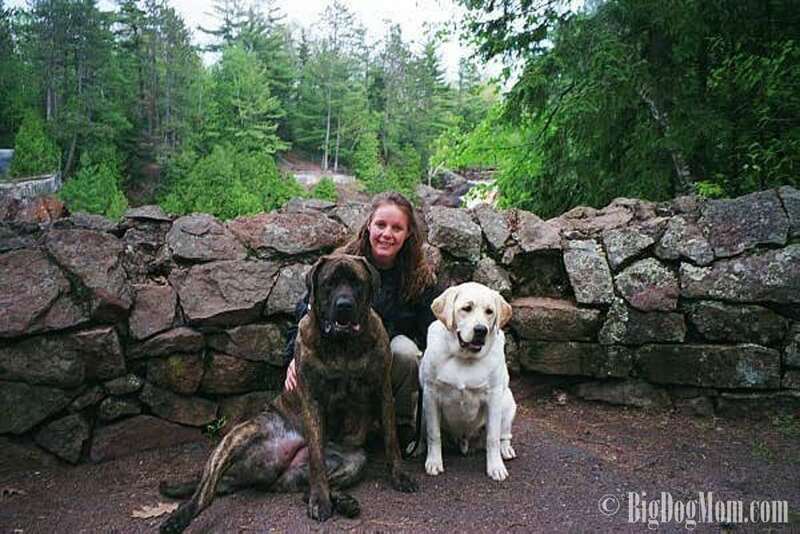 Maya, my first heart dog, was a beautiful apricot brindle mastiff and my first venture into the world of mastiffs as an adult. Three months after my husband and I picked her up we brought home little Burton, a gorgeous yellow Labrador Retriever. Burton and Maya were our kids before kids. They traveled with us across country, joined us camping, hiking and fishing, shared the joy of bringing our daughter into our family and eventually moved with us to Arizona where they both spent the last years of their lives. Maya was diagnosed with osteosarcoma five months before her 10th birthday. Cancer forced us to say a premature goodbye to our first born four months later. We were heartbroken. Maya will always have a special place in my heart. While Burton was still leaping into the pool at 14 years old, it was obvious to us that a piece of his heart left with her. Burton joined Maya in heaven 6 months shy of his 16th birthday. He spent his last two years with us trying to impart his wisdom and experience into our sweet, but very troubled, mastiff puppy, Linus. My journey with Linus could take up this entire blog for the next year, but for now, I will just say that I learned more in the 18 months with Linus than I had in the 35 years prior about canine behavior and temperament. He was a blessing from God and I will spend the rest of my life searching for answers for him and for other big dogs who struggle with inner demons they can’t seem to escape. Read more about our story in Life With An Aggressive Dog: A Letter To My Sweet Baboo. Now to the big fur balls at my feet and about whom I have no doubt you will fall in love with as I have. Sulley, our big, gorgeous fawn mastiff, turned two on December 4, 2016. He earned his AKC STAR Puppy and Canine Good Citizen titles with ease and is in the process of training to be a therapy dog. Sulley is my second heart dog and one of the loves of my life. All who know Sulley know just how much he loves people, children, and especially, other dogs. He became quite possibly the happiest dog on earth when we brought home (not so) little Junior on December 27, 2016. Junior is co-owned with our dear friends Tina and Todd at Jadem Mastiffs and he is a stunningly handsome, incredibly silly fawn boy who is still learning how to pee-pee outside. Whew, I promise I am going somewhere with this. Big Dog Mom – Knowledge without all the Fluff. In addition to being a place where I hope you will come to be entertained, Big Dog Mom will strive to be a place where you will find rich and informative content that will help and empower you to provide the very best care for the big dogs in your life. My choice of the word “Fluff” is not meant to be derogatory, but it is meant to convey the double meaning to include our smaller (fluffy) companions. I love all dogs and believe all of them have unique and special gifts. However, Big Dog Mom will cater to all things related to large and giant breed dogs. From training and health to showing and breeding, including all those who dedicate their lives to assistance, service and therapy work. If you own a BIG DOG or want to, Big Dog Mom is the place to be! I believe BIG DOGS have unique and special needs that deserve a place dedicated just to them! I have a little bit of experience in all sorts of areas as I outlined earlier, but I am far from being an expert. There are a few folks I know whom I would consider experts in their area of focus. My Ask the Experts section will be a forum for them to inspire and empower us by imparting their vast knowledge and experience. Please be sure to comment and ask questions below each post as that will be one method I will use to gather content for these experts to address. The strength of the Big Dog Mom community will be dependent on folks like you who share my mission of improving the lives of big dogs everywhere. Please follow me on Facebook, Instagram, Pinterest, and Twitter. Lastly, the best way to stay informed of all the action here at Big Dog Mom is to subscribe and join our community! Junior, Sulley and I look forward to sharing with you our journey and hope that you will come often to share yours. Together we will improve the lives of Big Dogs everywhere and those of us that adore them! You’re welcome. I am happy you liked it.